Kids do not need to give up their favorite outdoor sports when the weather is cold, snowy, rainy or stormy. 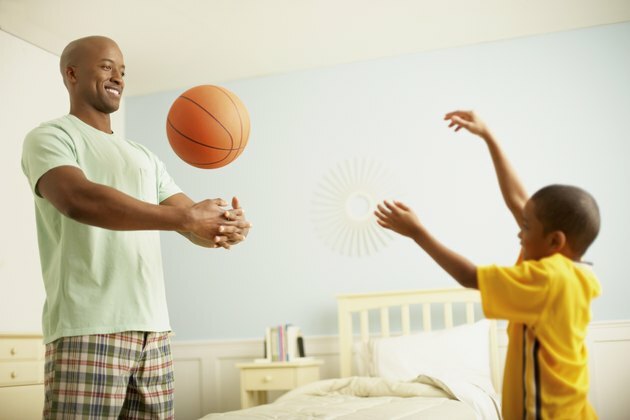 Make a few adjustments in playing equipment and rules, and your children will be able to play football, basketball, volleyball and other favorite outdoor sports in the basement or family room. The Family Fun website recommends indoor foot volleyball for bad-weather days. You will need a large open space, yarn or string and a big inflated balloon. Divide kids into teams of one or two players. Create your playing field by tying the yarn across a 10-foot area free of furniture and other obstructions. The yarn must be at least one foot above the floor, so attach each end to a chair or cabinet on the sides of the room. Each team moves to opposite sides of the string. Ask them to lean on the floor “crab style” with their faces up to the ceiling, using their hands and feet to support their bodies. They must remain in this position throughout the entire game. One person begins by kicking the balloon into the air. His teammate then scurries to the balloon and tries to launch it over the string and to the other side. The opposing team then kicks the balloon so it floats back. If one team allows the balloon to touch the floor on its side, the other team earns one point. That team then serves, trying to kick the balloon to the other side. Play continues until one team reaches 15 points and becomes the winner. Two teams of six or more people can play chair basketball. You will need chairs for each player and an inflated balloon. Create a parallel line of chairs for one team. Place the chairs approximately seven to eight feet apart from each other. Create a duplicate line of chairs for the opposing team, placing them at least 10 feet away from the first team’s chairs. Each player will sit in a chair facing her opponent. Alternating players on each side hold their arms out to form a hoop. An end player begins the game by throwing the balloon into any of his opponent’s hoops. She scores one point if the balloon lands in the hoop. She gives the balloon to another player on her team. If that player misses, the other team takes control of the balloon and one of its members tries to make a basket in the hoops formed by the opposing team. When one team reaches five points, all of the players who formed hoops become shooters and all of the shooters become hoops. Play continues until one team makes 10 baskets and wins the game. You will need a rectangular table and a balloon to play balloon football. Divide kids into two teams of one or two players. Each team stands on opposite narrow ends of the table. Drop a balloon in the center of the table. Each team tries to blow the balloon to the narrow edge of their opponent’s side. Teams score one point by blowing the balloon over the edge of the opponent’s side. After a point is scored, return the balloon to center of the table. Play continues until one team scores 10 points.